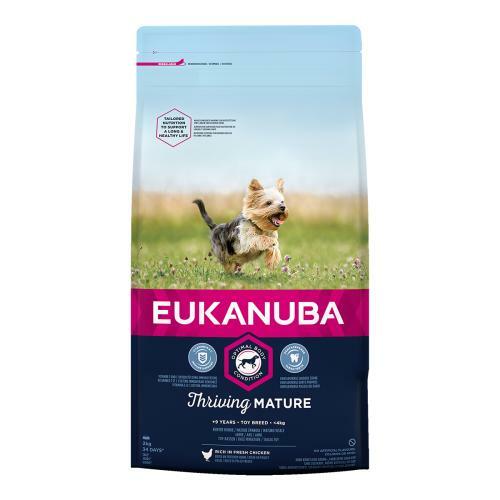 Eukanuba Thriving Mature Chicken Toy Breed Dog Food is a delicious chicken flavoured kibble that's been specifically formulated for adult toy dogs aged 9+ years. The unique Thriving Mature recipe is tailored to support optimal body condition and support healthy ageing. The tasty, small kibble is rich in fresh chicken and has been specially tailored to suit the needs of toy breed dogs. Plus, its unique hexagonal shape also helps to take care of your dog's teeth. Developed by nutritionists, approved by vets and recommended by top breeders, Eukanuba provides all the nutrition your dog needs for a long and healthy life. Dried chicken & turkey 26% (including chicken 16%), fresh chicken (15%), maize, poultry fat, wheat, fish meal, oats, rice, barley, chicken gravy, dried beet pulp (3.5%), dried whole egg, fructooligosaccharides (0.76%), minerals (including sodium hexametaphosphate (0.35%)), fish oil, mannanoligosaccharides, brewer's dried yeast, glucosamine (from animal tissues)(0.04%).